With the Jets winning Sunday afternoon, I should have known that the rest of my day would be filled with miracles. During the fourth quarter of the Jets-Patriots game, I was hooked up to the NST. Baby girl's heartbeat was fairly good - I thought it was my best NST ever. Toward the end of the test, there was one dip, which worried the doctor, so I was kept on a bit longer. Things did not improve, so I was whisked away to the labor and delivery unit. This was my third visit to this unit, so Jeremy and I were able to keep our cool. The only thing that wasn't great was that I hadn't had dinner yet - Jeremy tried calling two different Chinese places to order food and both had out-of-service numbers. This would prove to be one of my miracles later in the evening, since it was a very good thing I didn't eat. We continued our NST monitoring and the evening wore on - we were blessed with the fact that my BFF Amy was keeping Jack for the night, so Jeremy could stay as long as he was needed. Yet another miracle in the long run! All of the nurses are very kind here but are on the young side. Midway through my testing, a more senior nurse checked on me. She noted that my IV (which refers to the actual stick in my arm) was about to expire - they need to change them every three to four days. She went ahead and expertly found a new place for a new IV - which again would prove to be very helpful later in the night. Just as they were about to take me off the monitor, baby girl's heartbeat took a very severe decline. All of a sudden, my room was filled with nurses, an anesthesiologist and the ob/gyn doctor. I don't think I have ever been more scared in my life. They had me on my hands and knees, trying to elevate the baby's heartbeat - I was shaking. The ob/gyn looked at me, smoothed my hair against my head, and said, "Your baby is telling us it's time." I could not believe it was happening and happening fast, for that matter. They were trying to stabilize her heartbeat - if they couldn't, they were going to put me under and get the baby out immediately. If they could stabilize her heartbeat, then I could receive an epidural and would essentially be awake for the procedure with Jeremy at my side. Luckily, the latter worked out. They rushed me down the hallway on a gurney to the operating room, ER-style. The operating room was cold and bright - a million hands and equipment were swarming over me. I was terrified because I had no idea of how things would proceed. The on-call doctor for my practice arrived and assured me things were going to be fine and she held onto my hand as I got my epidural. The anesthesiologists were fantastic and were constantly monitoring me and telling me what was happening through the procedure. 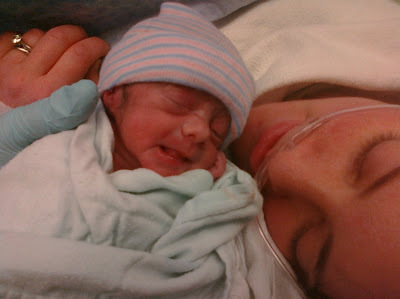 Jeremy joined me, and within moments, baby girl emerged and let out a big, beautiful cry. She was whisked away, and it took about another 45 minutes to finish the c section. Jeremy got to hold the baby and brought her to me. She knew me and I knew her. There was an instant familiarity and she smiled at her mama. Jocelyn Grace was born at 12:33 a.m. - exactly 33 minutes into my 33rd week of pregnancy. She weighed 3 lbs 6 oz - exactly half the size of her brother Jack at birth. She is small but mighty and we pray and pray that she continues to do well. Today, she has been breathing well on her own, digested all of the milk I provided her with and regulating her temperature well. Her heartbeat has been strong and solid (they are still trying to figure out why things were wonky - they thought they saw some kinks in the cord as an initial explanation).The doctors and nurses comment on how alert she is. Please pray that she continues to thrive in the NICU and that we get to bring her home sooner than later. We thank God for all of the miracles that happened to bring our strong baby girl to us. And we thank you for your unending support and love.